Brock Patrick Kaufman wears black high top Converse “Chuck Taylor” All Stars in the film. Caleb Meadows wears black low top Converse “Chuck Taylor” All Stars in the film. Best friends Ben and Cory rowing on the Wolf River. Happy Log takes us to the town of Biloxi, Mississippi back in 1959. 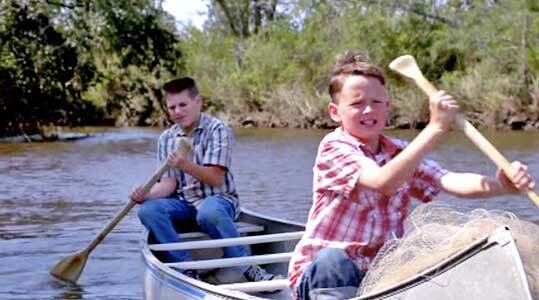 There we meet twelve-year-old best friends Cory Quavis (Caleb Meadows) and Ben Ladner (Brock Patrick Kaufman) in bayou country on the banks of the Wolf River where they like to hang out and fish. They both come from poor working class families. Ben’s father Darryl (Ladson Deyne) is a mechanic at the local service station, while Cory only has his mom (BreAnne DuCote), because his father was murdered nine month earlier. The boys are steadfast friends, but sadly misinformed about the facts of life, believing among other things that you can get a girl pregnant just by kissing her, something that they deal with when the flirtatious local girl Abagail (Valora McRae) comes their way. Cory and Ben are students in the local Catholic school and altar boys, although the first scene they are in belies that description when they “borrow” a canoe from two other boys who happened to stop nearby to play in the water. Their heist is particularly mean, as they not only steal the canoe but also take the other boys’ clothing and sneakers, leaving them only dressed in their underwear to get home. But Cory and Ben get away with it because the other boys took the canoe without their parent’s knowing about it. Cory and Ben discover Ned’s cash box. The big event in the Cory and Ben’s lives is their impending overnight stay on the river, their first solo outing. While the boys think it might be an issue, they both get permission to go, and so a few nights later set out in the canoe. They have brought along four large round candles taken from the church sacristy but not much else. That means they will have to live off what they can fish but that seems fine to the boys, although Cory begins to worry about the stolen candles and canoe. Ben tells his friend that he worries too much, and besides they are borrowing these items not stealing them. As dusk settles in the two prepare a makeshift tent by the side of the river and settle in for the night. 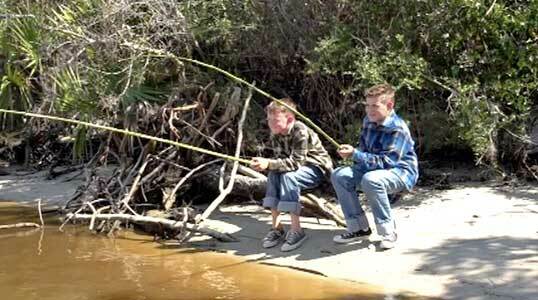 Cory and Ben fishing on the Wolf River. Meanwhile in the world of adults some bad things are happening, primarily involving Ned (Jim Tabor) the owner of the service station where Ben’s father Darryl works. Ned has a serious gambling problem and has been on a losing streak. Now it is time for him to pay up to the local mob who runs the bar and back room poker games in Biloxi, but Ned is reluctant to pay what he owes. It has gotten to the point where Billy (Brian Matney) the local enforcer and hit man has been brought to collect the money and make an example of Ned. Although Ned actually had the money needed to pay his debt, he was careless about leaving it unlocked in a desk drawer, and it is taken by someone else. Ned is taken captive by Billy and brought to the river for retribution, where they stumble on the boys’ campsite. Now the boys are in danger also, and the question is: Will they survive the night? Ben and Cory discussing life at their campsite. Happy Log is an independently made film that didn’t receive much in the way of promotion or distribution. It features all locals in the casting, writing, and direction which shows in places. The basic problem is the dichotomy of the subject matter: is this a film about two preadolescent boys starting to find their way in the world or is this a crime drama about the world of small town gambling? The script never fulfills the potential of either story and the two don’t mix in a convincing way that shows the power of friendship or creates a suspenseful crime drama. 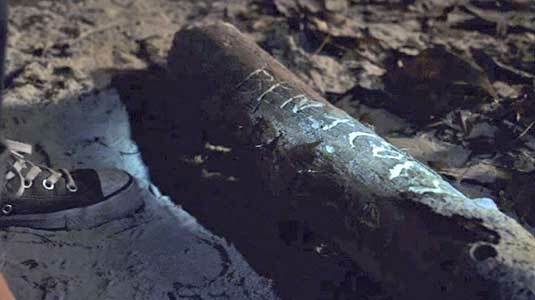 Many of the events of the story seem forced at times and not particularly realistic, especially at the end of the film. Plot holes also have a detrimental effect to the realism of the story line. Here are two from the early part of the film (so as not to spoil the ending for potential viewers). When Ben and Cory take the canoe from the other boys, leaving them stranded to get back home in just their underwear, wouldn’t that get noticed and talked about quickly in a small town, eventually finding its way back to Ben and Cory? And when Ben and Cory are about to go off by themselves on the overnight camping trip, wouldn’t their parents want to know exactly where on the river they were going to camp and how they were going to get there? They didn’t know the boys had the canoe so these are basic concerns that any parent would have. But if you enjoy watching a crime drama combined with two boys starting grow up in a parochial setting, then Happy Log is a film for you. Ben shows Cory the friendship log he has been carving. Ben is seated drinking a root beer. Caleb Meadows and Brock Patrick Kaufman who play best friends Cory and Ben wear chucks through the film. Ben wears a pair of black high tops while Cory wears black low tops without socks, popular footwear for boys then and now. The best scene is when Ben is seated in front of the service station drinking a root beer and Abagail comes over to flirt with him and get a sip or two of his soft drink. Abagail makes some moves on Ben. Happy Log. (2016) Caleb Meadows, Brock Patrick Kaufman, Jim Tabor, Brian Matney, Billy DeVille, Ladson Deyne, BreAnn DuCote, Bowie Hamilton, Valora McCrea. Written and directed by Gary R. Thiesman.